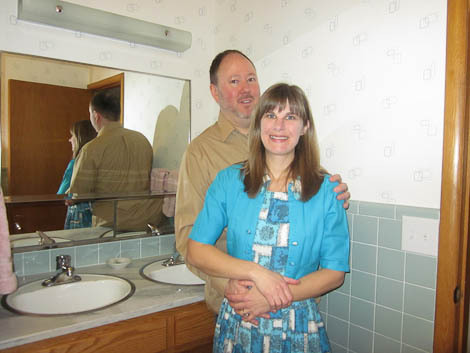 Kersten and James are gold-star Retro Renovators: With determination, imagination and good spirits to survive more than their fair share of speed bumps, they transformed the blah bathroom in their 1957 modern ranch house… into a blue, midcentury delight. Read on for Kersten’s story – which includes lots of salvage finds, help from another Retro Renovation reader, troubles with floor tile grout, wallpaper that fell right off the wall the first time around – but a happy ending. Thought I should write and tell you that, besides finding a better shower curtain, the bathroom is DONE. We started this project in October 2009 — on a whim that I hated the big box store bathroom vanity. Put it up on craigslist, sold right away, and although the original thought was just the vanity, it turned into much more. Two weeks after pulling out the vanity, I tore my achillies tendon (dancing). 15 months later, a 2nd tear to the same tendon, a floor mess up, and a wallpaper do over — WE ARE FINISHED! We had a vanity built by a local woodworker to mimic the one that Chris from Milwaukee with the killer time capsule has in his bathroom. 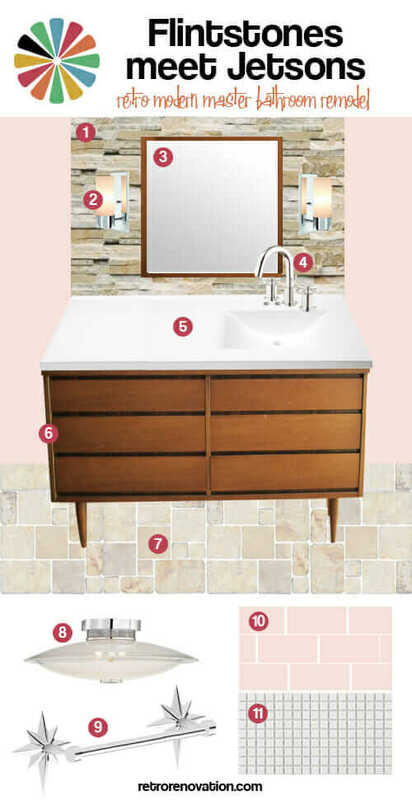 Chris sent me awesome pics and measurements and the woodworker used them to make the vanity. The cabinet maker, Dave, is pictured with me with the cabinet when it was going in. 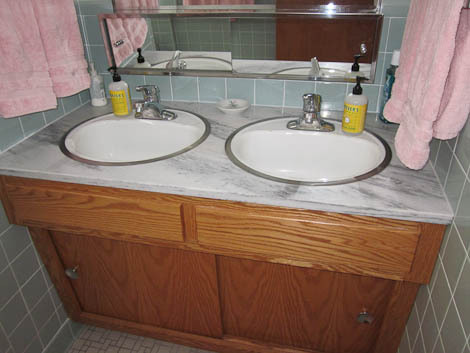 A friend gave us a beautiful old piece of carrera marble for the vanity top and we found 2 perfect sinks (with hudee rings) on ebay. It took our friend about hour hours to carefully cut two round holes in the marble for the sinks. It can crack easily, so he went slowly, and my DH stood alongside and sprayed the saw blade with water while he cut. He was amazing with his assistance and precise measurements from his rockin’ bathroom vanity. 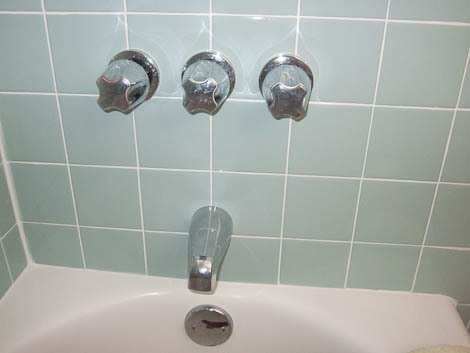 Oh, one other thing that I wanted to mention is that one of the best decisions that we would not have considered (brought up by our new friend that helped us with getting the wall tile up) is the new shower and tub knobs. Before we started, it had one of those one arm faucets that you find in hotel type bathrooms. Floor tile is Daltile “Random.” Only offered in Almond. If I were to do it over, I wouldn’t get almond. It shows every fuzz and hair that falls on it. 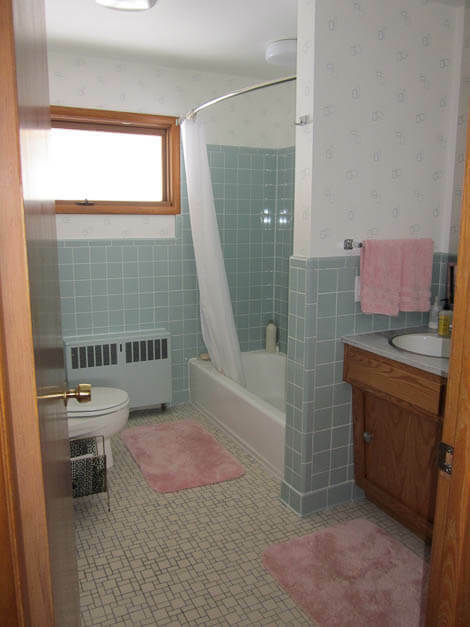 Originally, we wanted to order one sheet of one-inch pink and one sheet of one-inch blue and pop out random tiles here and there and place them in a way that we see in many midcentury bathrooms of this style, but they wouldn’t allow us to order one sheet – had to order an entire box. [Update: Wall tile is Daltile Spa.] Grout from Home Depot is Polyblend non-sanded grout in Delorean Gray. [In emails back and forth, Kersten explains how the first installation of the grout turned out poorly – I think what the issue was is called “hazing.” She spent hours… weeks… removing the grout and then continued:] We found a professional restoration guy that now is our friend. We wanted to hire him for the tile work, but he insisted we could do it ourselves so he got us (us, means my DH) started and trained DH to do the tile work himself. Took a while, but it is done. (I think another reader had the same trouble I did with the inconsistency of color. It is really very sad.) We (we meaning DH) did 2 or 3 tries of the dehazer (myric acid), and it helped a little, but not much. Thanks to your support, I didn’t give up on the idea of the double sinks! (Almost everyone thought the space was too small, but since there were 2 sinks in the original blue prints to the house, I knew it was worth a try!) Once you said “marital bliss”, I knew it was the right way to go! Not to mention my kids don’t spit on each other’s arms anymore when brushing teeth! So, “we” (meaning DH) resanded, then we got all the dust sucked up and then we sized it (again.) I LOVE this wallpaper and ordered it all over again when the first try did not work. I’m really enjoying the bathroom! 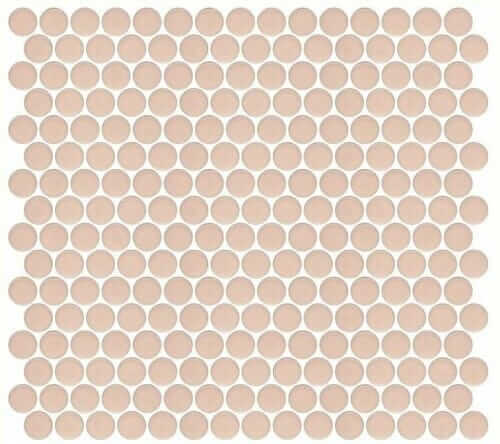 I’d really like other suggestions for the shower curtain. It will be okay until I decide what to do. 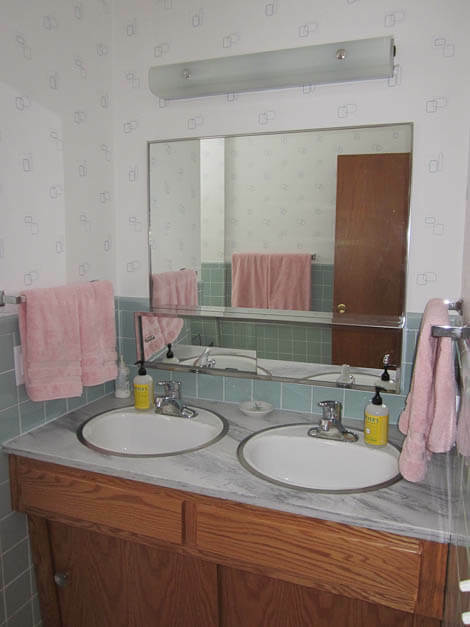 I bought it used on ebay and it wasn’t a very good picture and listed it as “pink shower curtain with valance” – so I assumed it was two separate pieces. Thought I’d use the valance as a window curtain. But, it is actually all sewn together, and I considered trying to separate the two, but I don’t know if it is worth it. The floofie-ness of the valance is growing on me. 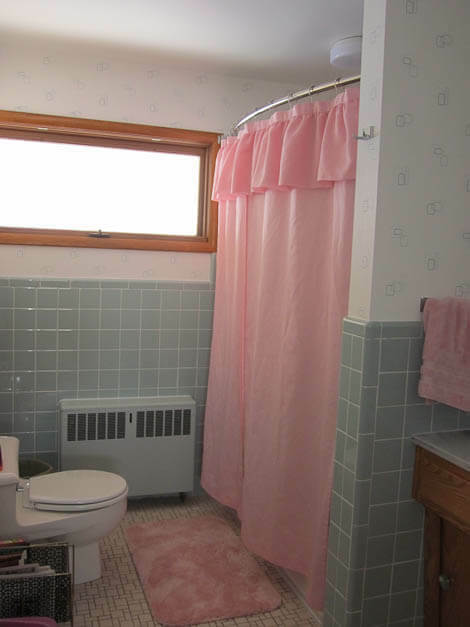 When my friend saw it, she called it my 1989 pink prom dress shower curtain. It splits in the middle and came with 2 tie backs, so I might try it that way too. The liner is white, so the pink would actually stand out more if I brought it back to each side with the tie backs. 🙂 I knew it would be a bit tricky with the pattern of the wallpaper, but I don’t know what direction to go. Initially, I wanted something bright and more atomic, but I can’t find anything that comes close. I looked at many of the new barkcloth patterns, but that means I’d have to make the shower curtain myself, and at this point, I don’t want another project. Ideally, I’d love a matching shower curtain and window curtain. NOW — onto the kitchen! Where I’m going to want massive amounts of ideas! The set of St. Charles in the garage want to come out and play! Yes, the dress is vintage. When my grandfather’s niece died about 2 years ago, the house was FILLED with 60 years worth of *everything*. This relative lived 2 doors down from my parents, and somehow, the son and his wife knew I’d LOVE all the vintage clothes! It was amazing. For weeks, she’d drop off boxes and boxes of dresses, shoes, purses, hats, etc. Luckily, the coolest ones fit me! They are my summer wardrobe! 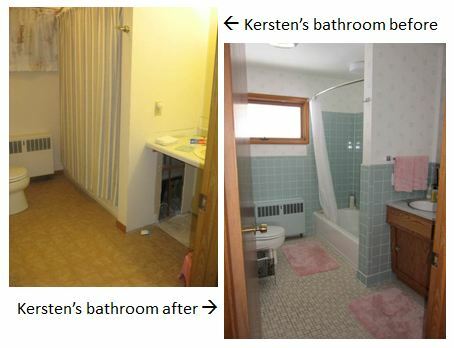 Kersten – Your bathroom turned out beautifully. It looks like it’s always been there – but it’s new! 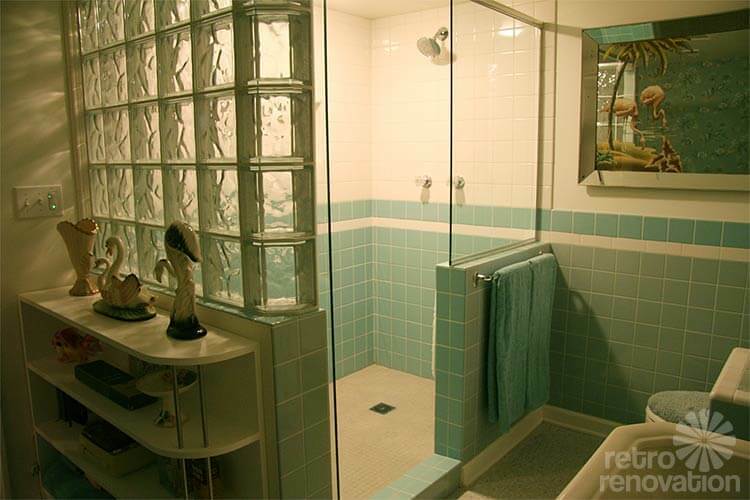 The color is terrific – in fact, it appears to be a close match to my blue bathroom with its heron blue tile from the now-discontinued Maple Leaf tile. It’s great this is now offered by Daltile. I’d actually place Kersten in one of the blog’s first wave of regular readers. My first email from her was 9/9/09 (and in reality, sooner, because even then I couldn’t keep up with email.) What’s also typical, I think, is that a Retro Renovation journey is the road less travelled. Speed bumps? Yes. Potholes, too. You just gotta trust you’re going to end up someplace extra special good. 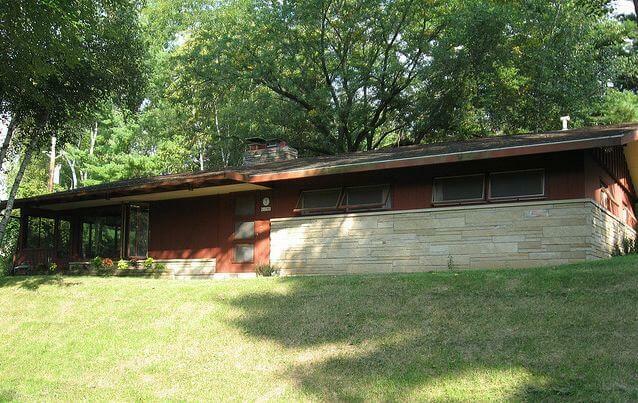 You can see more of Kersten and James’ lovely 1957 ranch-modern house on flickr. Thank you, two, for sharing!!! Absolutely beautiful job! I think that Kersten and James achieved the look that they were going for – and then some! I would have thought that it was an original period bathroom if I hadn’t been told. I love the choices of colors and fixtures and it was really cool of Chris to help them out with specifics to reproduce the vanity! And $2.50 for that mirror – oh my stars! score! Man I’m pumped! My bath is just about finished except for the floor and the tile! Maybe I CAN do that tile myself?? I’m stuck on coral tile from Daltile or seafoam green tile from BW?? Someone on here giving info to another for a project – that’s the way it should be! Okay, I know its a tile problem, but…what is “hazing” ? We have a tile project coming up, and if there is pitfall, tell me NOW! Can someone who undertstands tiling and grouting explain hazing, please? I have heard of it… it was raised as a watch-out when my tile work was done (I used a pro) but it was a minor minor issue. Carri — K&B designer — can you weigh in? Hi Pam. A little late reading you this morning. Digging out in Minneapolis from 13″ of snow! As for all this hazing. Tile, whatever kind it is sometimes hangs onto the grout. 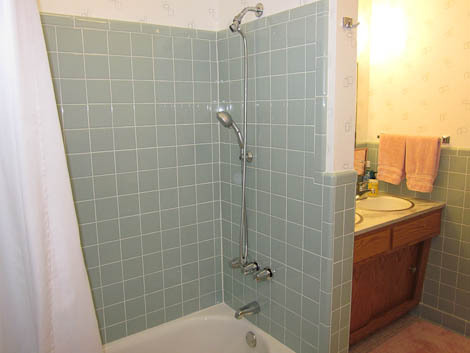 Shiny ceramic tile – no problem. Matte finish tiles will hang onto the grout. The remover can help but it will eventually wear off. The answer is the beginning. There are two different kinds of product. One is called a “Grout Sealant” the other is a “Grout Releaser”. The “Grout Sealant” is something that is put on the tile after installing bur prior to grouting. It will protect the tile from the grout. 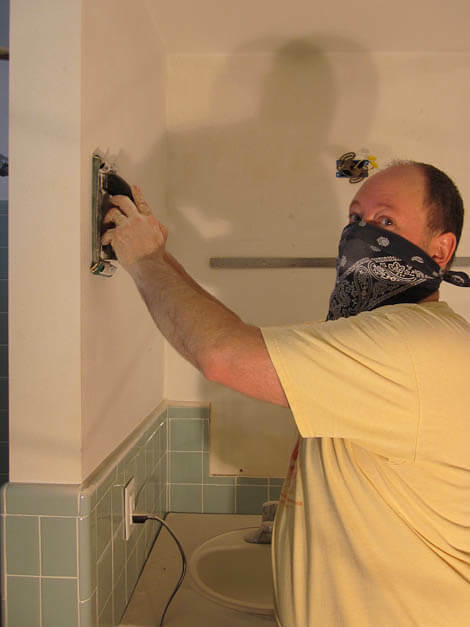 You should be able to just wipe off the grout but you might still need the haze remover. The “Grout Sealant” will remain on the tile for a period of time as a protection. This is a good product to use with a matte tile. The “Grout Releaser” is a temporary product. You use it the same as the “Sealant” but it will come off when you clean the tile. I was just dealing with someone in the same situation and my great tile installer/source Jan Hohn, says she used 510 Porous Plus. So, long story short, everyone Google that product. Even Jan said she can’t really say the difference between “Sealant” and “Release”. Be careful though. If you’re working with stone or other kinds of tile there are different products for them than ceramic tile. Hope this helped. Sorry it’s so long. There is so much to know about tile and want to make sure it’s the correct information. I’m really happy to help with the tile stuff. I love tile and have a lot of experience from selling it and installing and have excellent connections. 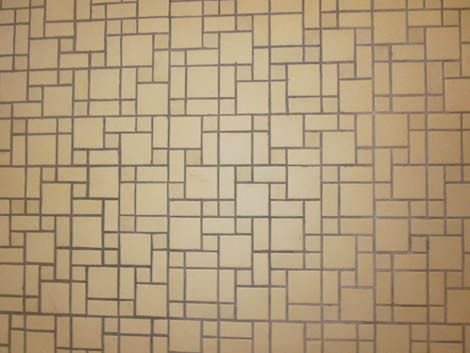 I know of numerous sources for all the mid century tile and would be happy to share the information. Carri, the issue isn’t the tile — it’s the grout. It’s randomly colored rather than consistent. I thought this was called “hazing” also???? Also, everyone, I am adding this DISCLAIMER: This is not a DIY site. Carri is providing info based on her experience out of kindness. My official recommendation remains: that if you want a warranteed outcome: Personally consult with or use a professional. Pam, I agree as far as consulting a professional. Tile installers are so smart and I think worth the money. I”m sorry about the confusion on hazing. I will look into this more. Chances are that it has to do with the consistency of the grout. How much water is mixed with the grout. I will check with my pro and see what she says. We had a couple issues with the floor tile. 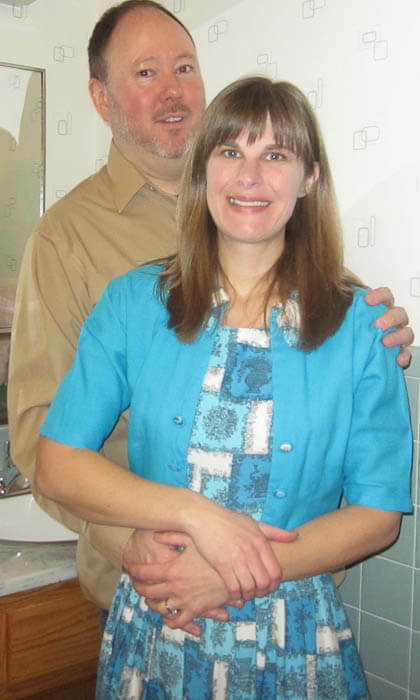 Unfortunately, it was laid poorly, and my husband really wanted to start over, but with around $1000 into it, there was no way I was going to start again. *I should note that it took over 2 months for us to get the floor tile in the first place. 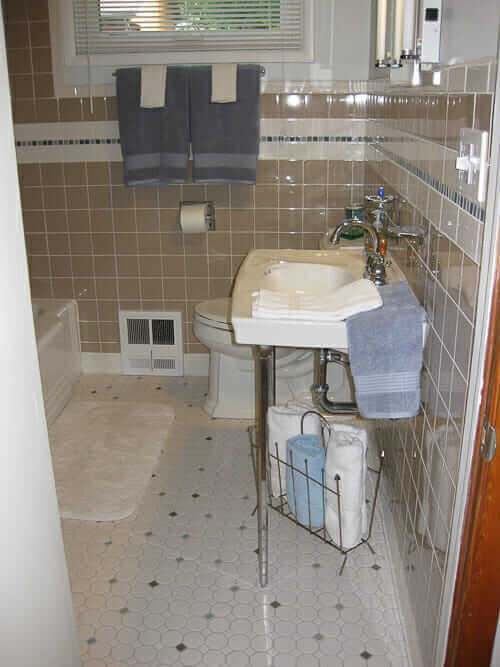 * Both the wall tile and the floor tile were special orders. I would not recommend the grout that we bought from Home Depot. After the first grouting, it looked BAD. The grout color was uneven and it left a sad haze over the beautiful tiles. I hand removed miles of grout and a professional did the 2nd round of grout, and it had similar problems with the color. The haze is a cloudy layer that is hard to get off the face of the tile. We bought a “haze remover” and as noted, we tried it 3 times. It helped minimally. I try to tell myself that this just enhances the look of vintage, but it’s hard — knowing how beautiful the tile was before it was put in. I guess I should note that the gray grout was the one that gave us issues. It was as if the pigment didn’t mix in well or something. 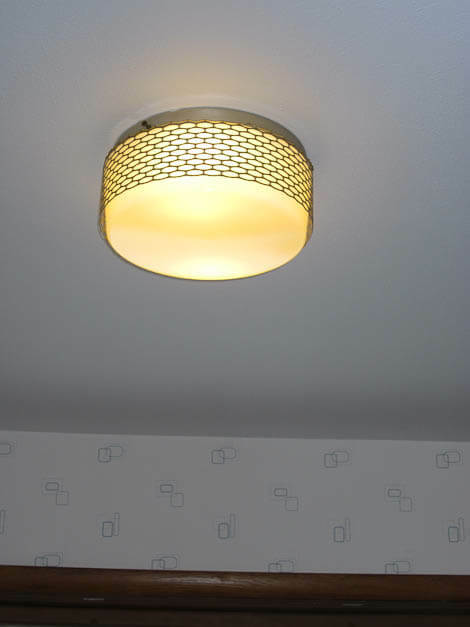 We also used a white grout of the same brand for the wall tiles, and it didn’t seem to have any problems. Thanks to everyone who responded. I am VERY glad I wrote. We will be working with a matte finished floor tile, so this grout hazing could potentially be a problem. Especially since I was planning on using a grey grout. From what I gather, the safest procedure would be to lay the tile, then seal the tile, THEN do the grouting. The sealer should then be protecting the surface of the matte tile to make the grout wipe off cleanly. 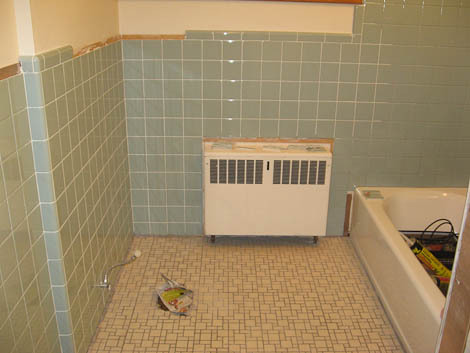 Again – I think that Kersten’s issue was with the variations in color of the GROUT. I have been calling that “hazing” rightly or wrongly. CONSULT WITH PRO’s. I think it could be a matter of the nature of using little tiles…you see the variations in the grout so much more than in the larger wall tiles. Also, you are probably being extra critical of your own work. My original little tile floor shows slight variations in the width of the grout and some tiles don’t line up exactly perfect. Also, I have the matt finish, and the only time it looks clean to me is when it’s still wet. I wish it was glossy tile. I thought all tile was sealed when it was made/baked. What a fabulous bathroom! I’m in love! The wallpaper is awesome! Thanks for sharing the info about the grout and tile. I never would have thought to ask about it, and I read your post literally 5 minutes before my contractor came out to talk to me about our bathroom tile. Fortunately, he was aware of the issue and mentioned sealing the tile before I had a chance to bring it up. Whew. 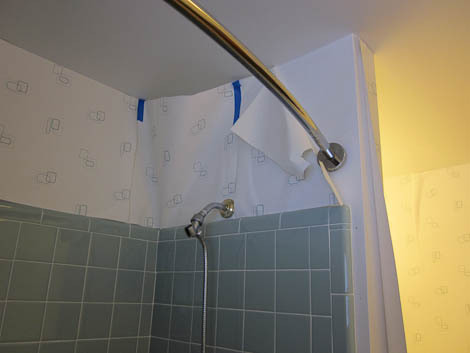 Regarding the shower curtain – maybe check out simple ones that you could spruce up? I got a couple of fabric shower curtains on clearance at Target a few weeks ago – for $3 and $6 – and plan on doing some large-scale embroidery on the grey one that will go in our pink bathroom. Maybe starting with a ready-made one would make it less daunting and time consuming. I expanded a half bath to a full bath using this same tile. I want to give more information about the tile in case anyone wants it for their home. The color is called Spa Blue. Dal Tile calls it a special order. I waited a minimum of a month to get the tile. I just want to make sure that nobody thinks they can run out and find this tile sitting ready in a store. I put this tile in with a 60s blue tub mfg. by American Standard. It was still in its orig. crate when I found it, and this means it had never been used! 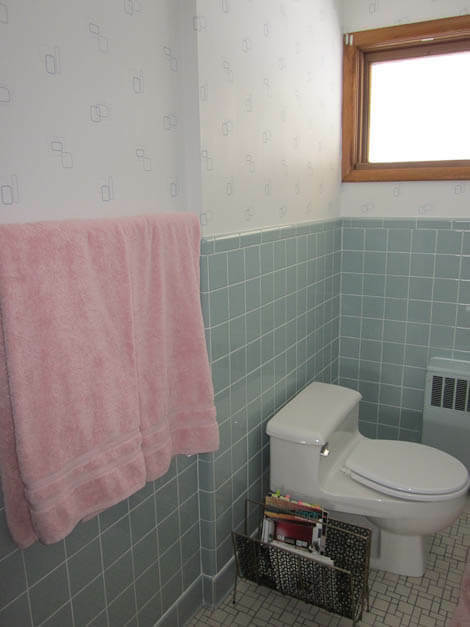 I am thrilled with a 1962 home that has pink and blue bathtubs. Everytime I see people that love and preserve their vintage homes it almost makes me need a kleenex. I also custom ordered my tile for our bathrooms from Daltile. We used the custom tile creater thing online to do this. I saw it in a previous post from Pam. It took 6 weeks to come in, but that wasn’t a big deal for us since it is still sitting in the garage. Ha. Natalie, that custom tile link seemed so cool and would’ve been the answer to our desire to mix in some pink and blue tiles, but we figured it would be cost prohibitive. If it was spendy, I recommend long chats with Carri to get the grout (or tile prep!) right and not let it ruin the tile. Our floor tile is matte finish, which sounds like it can be a touchy surface for the grout — if only I knew that earlier! It was probably more expensive going the colored route, but we have a countractor friend who got us a discount because he has an account with Daltile. They do charge if you don’t order the minimum, which we didn’t. So that was an extra $125. And yes, I am definitely taking mental notes on the grout and plan on asking our contractor friend about it/getting someone to grout the floor for us. I ordered Daltile in Spa last month from an online outfit called Tile Supply Online (www.tilesupplyonline.com). They only sell Daltile, and while the selection is rather limited, they do have many colors of 4 1/4 field tile and matching trim and a few floor mosaic choices. I ordered on a Monday and the tile arrived at my house the following Saturday – 5 days! Their prices are really great, too; the best I found by far. I highly recommend them.